Keeping a prayer journal is a great way to stay focused while you pray, to encourage you that you really did pray, and to look back to see how faithful God has been in carrying you through so many prayer requests. Just as there are a variety of ways to pray, there are numerous ways to keep a prayer journal. 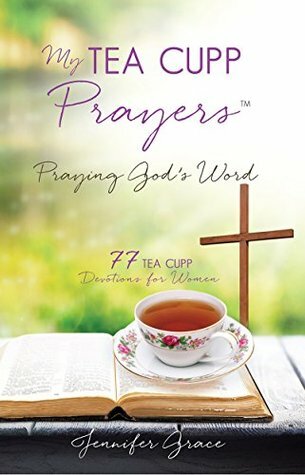 Today I’d like to show you how I do My TEA CUPP Prayers prayer journal, and soon I hope to give you one along with my book. For now, start by finding a notebook you know you will use. I like a spiral notebook that is about the size of my Bible. The prayer journal and Bible fit nicely together in my book bag. The spiral binding allows me to open it flat or flip it completely open while I am journaling. You can find inexpensive notebooks and journals at Walmart or Target or Family Dollar, or you can find a pretty flowery one at an office or gift store. Whatever inspires you and helps you pray is perfect! Next, find your pens. If your favorite color is purple, perhaps you’d like a purple pen! I use blue Pilot G-2 pens for most of my journaling because of the smooth writing ability. I always need two or three, because they run out right in the middle of my prayers and I don’t want to have to get up and search the house for another one. Have extra pens right by your Bible and journal in your quiet time spot. I soak up all He has to tell me and underline my favorite verses. I label the verses with the letters of the TEA CUPP acronym, so I may use them in my prayer journal. Then I open my journal and get it ready for my prayers. I write the date, then going down the page I write T-E-A. On the next page I write C-U-P. And on the next page I write another P.
Some Bible reading days have so many verses that it is hard to pick which ones to use. Other days I don’t have enough verses, so I go back and use verses I underlined in the previous weeks. I find a THANKSGIVING verse and write it next to the letter T to thank God for His blessings. I find an EXALTING verse and write it next to the letter E to exalt and praise my Jesus. I find an ADMITTING verse and write it next to the letter A to admit my sins and ask Jesus’ forgiveness. On the second page of my journal, I find a CALLING verse for something God is calling me to do today and write that in my journal next to the letter C. I find an UNDERSTANDING verse and write it next to the letter U as I try to understand my story a little better. I find a beautiful PROMISE verse and claim that as I write it next to the letter P.
On the third page, I find a PETITIONING verse to use to pour my heart out to Jesus in prayer. I pray all the parts of My TEA CUPP, filling in the extra spaces of my journal with more prayers on each letter. Then I fill the rest of the PETITIONING page and perhaps another page with all my prayer requests for family and friends and loved ones. If I am traveling or just had a new baby, I sometimes do just one letter a day in my prayer journal. But I feel most complete when I have time to do all the parts and talk to Jesus about everything that is on my heart that day. Today’s TEA CUPP: I hope today’s devotion helps you as you fine tune your own prayer journal and devotion times with Jesus. If you need ideas for Bible verses I have oodles for you here. Someday, you will look back on all these prayers and be praising Jesus for His goodness all over again! No tea, no cup, no plate, no food, no beverage, no water, nothing to nourish this earthly body, only God’s Word to feed my soul and His Living Water to quench my thirst. This is an Esther fast, where we give up eating and drinking for a time, to pray and focus on Jesus and God’s Word. When I first started a daily prayer time with Jesus, I didn’t know what fasting was all about. My church didn’t talk about it, and there weren’t too many resources. I wondered what the “rules” were. As it turns out, there are no rules, only examples. In our Bibles we have the example of Esther who fasted with her maidens for three days to save her people. Esther’s fast happened one time during an extreme crisis. They had no water and no food for three days and nights. We also have the example of Daniel who gave up rich foods, eating only fruits and vegetables. Daniel’s fast was a way of life, along with praying three times a day. And, of course, there are Moses, Elijah and Jesus who fasted for 40 days and nights during a time of great trial. If you are just getting started with fasting, I would recommend a one-day juice fast, where you only drink juice, a juice and banana fast is good for nursing moms. You can work your way up to a full fast when the time is just right. Some might think fasting is a thing of the past from Bible times, but it is still practiced by many Christians today as they seek God’s will in prayer. If you are looking for a modern example of fasting, I encourage you to read The Heavenly Man. This book gives testimony after testimony to fasting and prayer, from friends praying for the persecuted pastor to him praying and fasting himself. I highly recommend The Heavenly Man. Order a copy for yourself and share one with a friend. Today’s TEA CUPP: Once you get started on fasting and prayer, you might like to plan a regular day to fast, such as the first day of each month, the first Sunday of each month, or every Wednesday. Or when there is a great trial or event in your life. Write it on your calendar and commit to this time of prayer and fasting with Jesus. Read Isaiah 58 in preparation. Another devotion you may enjoy reading is The Empty Plate. …did you really fast for Me—for Me?